My mother tells a lovely anecdote about being on holiday in Sicily in the summer of 1975. She was so impressed with how the men were dressed. “Everything was so tight, from the jackets to the trousers and all the way down. Form-fitting, nothing out of place. 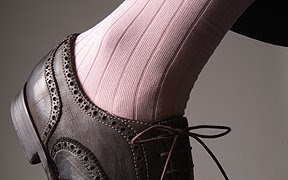 And they were all wearing these fine, pale-coloured socks – very light and in every pastel colour you could think of. So if you’re worried about messing with the line of your suit, that’s where to store things. Notes might work better than loose change, though. And you’d better be wearing calf-length socks. You can follow the discussion on Where Italians keep cigarettes by entering your email address in the box below. You will then receive an email every time a new comment is added. These will also contain a link to a page where you can stop the alerts, and remove all of your related data from the site. One of my pet peeves with most Italian tailors…. When fitting the suit, I always ask them to account for some of the things I always carry with me: wallet, cigarettes, etc. Their response, “No, a gentlemen has someone else carry this stuff around…” Can I argue with that kind of response?